As I’ve mentioned before, my first MMO was Final Fantasy XI, and I think I’d be remiss not to observe that a lot of my MMO habits came about as a direct reaction to that game. My love of soloing comes in no small part as a result of the misery of trying to get anything accomplished by myself in Vana’diel, for example. Alts appear to be more or less the same thing. Saying that having an alt in Final Fantasy XI was counterproductive is like saying that arsenic is unhealthy. This was one of the many traits that Final Fantasy XIV carried over from its predecessor, but it removed any real option of having a second character serving as your bag space expansion because there wasn’t a proper mail system to facilitate it. So there was even less reason to pay for an extra character slot there. Alts were just as absent in Final Fantasy XIV’s original incarnation. But this might be changing on both sides of the equation. FFXIV’s Legacy players get extra slots for free, after all. Might there be some hope for alts in the future? FFXI is actively inimical toward alts in a way that other games really aren’t, and that extends beyond the game’s “one character can do everything” nature. One character can also level everything in The Secret World, but the process of doing so is far less arduous. Let’s leave aside the idea that a second character is going to require you splitting your time between two characters and you’ll thus be slower in leveling; that’s true in every game. FFXI also has a large number of elements that require lengthy and difficult quests to unlock, and those elements are far beyond matters of convenience. You need these things to be functional in the game. Subjobs are an obvious example I’ve brought up before, but there are others. Airship passes, for example, are annoying to get at the best of times. The one to travel between the main nations requires you to complete a mission that requires either a large group of allies or a dedicated friend who can keep you in Sneak and Invisible while you dart past corridors of murder. Traveling to Kazham requires you to farm enemies that you are probably just strong enough to beat reliably if you’re an offensive class rather than a mage, and that was just to level for five levels. Traveling to Whitegate for the first time means doing both of the subjob quests again. And that doesn’t even touch on advanced jobs, also known as the real meat of the game, each of which requires another ornate quest to unlock, some relentlessly brutal. FFXIV isn’t quite this cutthroat, but even it had things like Chocobos that had to be unlocked again for each subsequent character. FFXIV’s lack of any interaction between your characters also meant that a new character started without most of the benefits that a higher-level character can provide. Rather than having a leg up in what you’re doing, your only real advantage is a knowledge of what comes next. As a result, it’s not surprising that the only alts in FFXI were meant to serve as banks to make up for the game’s awful inventory system. Both games are pretty unfriendly to playing more than one character. FFXI arguably went a step further by allowing you to change your allegiance in terms of nation, meaning that the number of choices you had to make permanently were vanishingly small. The odds of your having a need to create alts in FFXIV or FFXI is still low, although the latter will probably still require you to do so insofar as you need to deal with that stupid inventory system. But perhaps the games are becoming a bit less actively hostile. FFXIV’s relaunch will have a proper mail system, but for many players, it’ll also be bringing in existing high-level characters. You’ll have fewer reasons to see the lower parts of the game if you’re already level 50 with several classes, even if you will have a few new things to level such as Arcanist. So there’s a little more impetus for you to start fresh and experience things anew. Plus, if you really want a bank alt, the game seems poised to facilitate that. But leveling in FFXIV has never been particularly brutal, at least not since we moved past the days of randomized skill gains at launch. (I occasionally wonder how I actually played the game at launch.) FFXI has far less forgiving leveling, and even if a lot of those barriers to entry are removed as has been promised, it’s questionable how many other characters you would actually need. A lot of that depends upon Seekers of Adoulin, which I’m slowly getting excited for. If that expansion is both replete with one-time choices and accessible from a reasonably lower level, it might facilitate our having more than a single character in Vana’diel. Alts by definition require you to have choices to make differently the second time around — choose a different race, a different class, a different faction. FFXI and FFXIV don’t have any of those one-time choices past the first, as a rule. Honestly? I don’t see either game making alts very attractive. But I’d like to think it’s possible if for no other reason than I want to play about seven different characters in FFXIV’s relaunch. 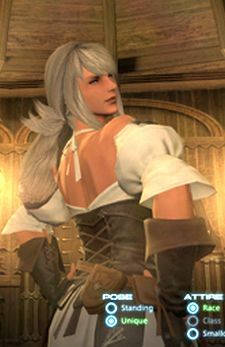 Come on, people: Highlander women.Here is what you want more content, click FFXIV Power leveling.